Life and the lies of a high functioning addict. Hollywood has certainly often painted the picture of addiction and functioning addicts in a certain stereotypical fashion. We as an audience are shown addicts as down and out people, the afterthoughts of society, often dregs of a community. Or on the polar opposite side of society as the big rock star who falls from the fame pedestal into a swamp of despair or more commonly seen, and used as a metaphor far too often, as the rock bottom moment in life. But as we also know – Hollywood, entertainment and even the media, in general, aren’t always the bearers of the whole truth…The reality of the matter is that addiction can be likened to a candle, slow burning and with a myriad of complex issues leading to a disability which an addict deals with. In fact, recent studies have shown that those who are high functioning addicts are actually quite hard to pin down and define. 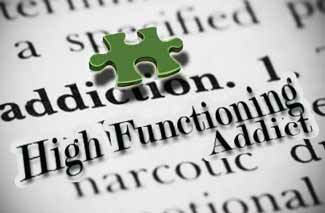 So what is a high functioning addict? Functioning or high functioning addicts are people who often despite their addictions, still project an outward appearance of normalcy. Yes, normalcy is a hard one to define but what we mean by that is that they enjoy reasonable to good societal norms and even seem to reach high degrees of success. They are employed; they have lives outside of their work space and dress the part of a regular functioning adult in society. That is however a really well constructed illusion and despite what the outward appearance may show, inside there is a raging war, and it is very real and very dangerous. A majority of addicts are not able to sustain this façade, and their habits for ever and eventually a knock at the door of health, relationships and quality of life will be heard. How does a high functioning addict keep up appearances? Good question. A High functioning addict will often be highly skilled at hiding their issues and problems – especially from those close to them. There is of course a fear that if their dark “secret” is discovered, the buildings of success (career, reputations, relationships) which they have built will come crumbling down. A high functioning addict’s façade however is not perfect. There are chinks in the armour and those tell signs are clues to revealing the true story behind the addict. A high functioning addict will often escalate their consumption intake with increasing frequency. As the negative and draining effects of addiction begin to wear down the energy of a high functioning addict, you may start to see less care being taken around their appearance. Often someone who once looked neat and professional has over time come to appear dishevelled and untidy or even messy. This is because as the addiction takes over, health suffers and there is less energy to keep up appearances. A High functioning addict will often work in ‘enabling’ environments. The saying, “Birds of a feather, flock together” has never been more apt. An addict will hang out with other addicts so they can both validate their own behaviours and to share the source of their addiction. Take a cocaine user in a high stress office situation. He or she will hang out with someone in a completely different department because they have common ground, even if they barely interact as a result of their work requirements. A high functioning addict will probably use up as much of the sick card as possible. It’s blindingly obvious actually. Think of why: Terrible hangovers, nausea, anxiety, headache, sweating, fatigue and post nasal drip which are all common withdrawal symptoms from drugs and after effects of drug abuse to the body. As a result, work performance may drastically drop off, and they can become unreliable when it comes to tasks they previously aced. Also, a high functioning addict may stop doing the things they once loved or where known for, like hobbies or pastimes. Remember the guy in sales who always raved about fishing on the weekends? Why hasn’t he fished for months and hasn’t spoken to anyone about fishing for ages? Social engagements and activities will also start to dwindle from their calendars, especially the ones which don’t involve using or consuming a drug. What follows may be best described as isolation from work or home. Brain functions such as memory issues are also common as substance abuse takes hold of the high functioning addict. They may find themselves trying to remember or put together pieces of a situation, like a big night out or have what is often described as a “blackout” – where total loss of memory is experienced. This is a massive indicator that the substance abuse is already at a stage where it is affecting a person’s normal brain functions. The money begins to dry out. Many high functioning addicts end up with financial issues, and guess who they turn to? The people close to them, often loved ones who in turn enable them by providing a source of income. Someone who has a decent job that pays well – and doesn’t have a lot of expenses shouldn’t find themselves in financial difficulty – so look behind the curtain. And, a word of advice, this should be checked before the inevitable legal issues come knocking. A final note to remember is that a high function addict can and will become a non-functioning addict with time. Addiction has many golden rules to follow and remember in order to conquer it – but remember this one: An addict is not a lost cause and that means neither is a high functioning addict. With love, support, and treatment, recovery is definitely possible! Click on the green envelope below and fill in our contact form, and one of our professional staff members will get back to you via email or phone, respecting your anonymity at all times. Functioning or high functioning addicts are people who often despite their addictions, still project an outward appearance of normalcy. Alcohol. The most deadly drug of them all.